Despicable Me: Minion Rush is an endless runner for the iPad, iPhone, and various other platforms. Based on the popular Despicable Me films, Minion Rush is an endless runner games, and like most endless runners, the goal is to collect coins (in this case, bananas) while dodging various obstacles in your path. You'll also collect coins that can be used to unlock various aspects of the game, though these come much slower. The longer you run, the more bananas you can collect, which means a higher score. If you want to hit the ground running, just follow some of these basic tips. Minion Rush adds a few new mechanics and some new environments compared to older endless runner games like Temple Run, but the basics are the same. You'll be running, dodging, sliding and jumping to avoid obstacles, and with one big mistake, you'll be starting it all over again. The biggest tip in any endless runner game is to focus more on upcoming obstacles than collecting coins, and Despicable Me: Minion Rush is no different. If you are on the far side of the path and need to switch all the way over to the opposite side, it is better to do it sooner and skip some bananas than to wait and accidentally splat into an obstacle. You can swipe left and right to navigate obstacles through most areas of the game, but at certain times -- like when you are on a green patch or riding on a rocket -- you can use the tilt controls to navigate. Don't forget that you can dodge left or right while in mid-air. This is a great skill for avoiding some obstacles or simply preparing for any upcoming dangers you see along the path. You pick up multipliers when you run over other minions. This makes them worthwhile even if you skip a few bananas in order to squash them. The multiplier will bring in more bananas than you skip. You can gain more coin by completing goals. Always check your goals to see what is available. Sometimes you can complete a goal simply by going into the shop and buying an item, such as unlocking the Banana Splitter. 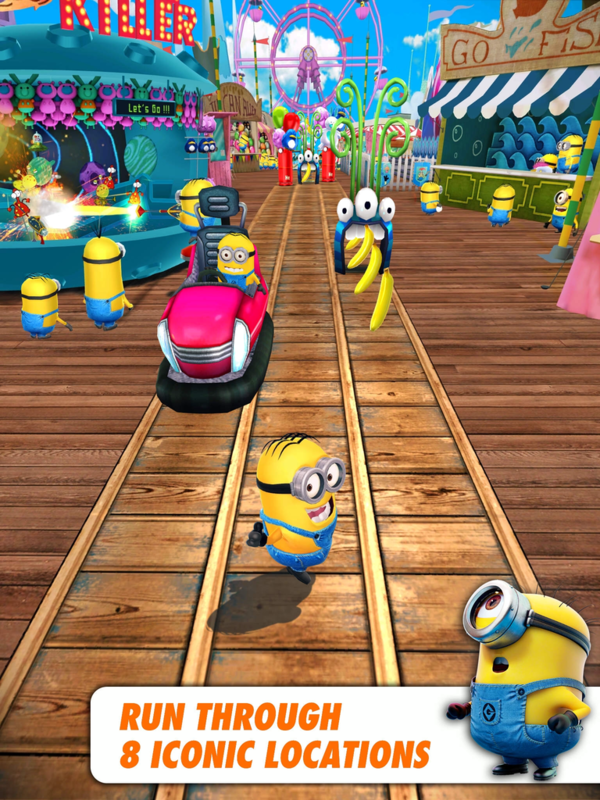 One neat twist in Despicable Me: Minion Rush is the Fluffy the Unicorn mini game. You'll need to unlock it in the shop first, but once unlocked, you should prioritize picking up the unicorn when you see her in the game. This will activate a mini-game that allows you to earn bonus bananas. Referee. Mega Minion lasts 5 seconds longer. Costs 2,500 bananas. Baby. Increases Despicable Score Multiplier by 1 level. Costs 20,000 bananas. Mom. Banana Splitter, Freeze Ray, Banana Vacuum and Minion Shield last 5 seconds longer. Costs 150,000 bananas. Worker. 10% increase to bananas collected. Costs 550 coins. Firefighter. Increases Despicable Score Multiplier by 3 levels. Costs 1,200 coins. Ninja. Increases Despicable Score Multiplier by 6 levels. Costs 2,800 coins. Alarm. Mega Minion and Gru's Rocket last 15 seconds longer. Costs 7,000 coins. Dad. 1st Revive is free in every race. Costs 7,000 coins. Singer. Despicable Actions reward double Despicable points. Costs 550 coins. Maid. Increases the chance of finding Freeze Rays. Costs 4,500 coins.